Spring is nearly here (on March 20th to be exact) and it’s about time for spring cleaning! If the words ‘Spring Cleaning’ makes you shudder, we’re here to help. Often, the hardest part of spring cleaning is getting started. We have grand plans of what we want to get done, jump in and quickly get overwhelmed, quitting before we get halfway through our list. Instead of repeating that cycle, try these tips to get, and stay, motivated during spring cleaning. If you’ve ever gotten overwhelmed thinking about all the things you need to do in a day, then you’ll know why it’s important to make a plan. Guess what: spring cleaning doesn’t mean clean everything! Take a moment to walk around your home and pick out areas that need a little extra love. Don’t confuse regular cleaning tasks with spring cleaning tasks! You’ll want to use this time for larger, less frequent tasks like organizing your garage or getting your backyard in shape instead of dusting or scrubbing toilets. No one wants to spend the entire weekend cleaning. Be realistic about your time and be flexible. It’s much easier to focus on the task when you have an end goal. Give yourself a set amount of time to complete a task and stick to it. Spring cleaning doesn’t have to happen in a single day! Put on your favorite music or podcasts and have a little fun while cleaning. Try listening to fun, energetic songs that will keep you moving. Or you can listen to an audiobook. This way, you’ll be entertained while getting your tasks done. Don’t do this alone! Enlist help from your family members (even the smallest member can at least put away their toys). Everyone should pitch in. Everyone should be responsible for their rooms and the remaining tasks can be divided up based on who can tolerate any given task. Your cleaning time will be reduced with extra hands on the deck. When you’re in the midst of cleaning, you can lose sight on why you’re working hard. Especially if you feel your hard work will go unnoticed. Instead of focusing on how your family will react to your hard work, think of how you will feel when you’re done. Maybe you’re cleaning your home so you don’t have to do a mad dash before company comes over. Maybe you’re cleaning for your own peace of mind. Whatever the reason, remind yourself that you’re working to create a better space for you and your family. Don’t forget to reward yourself for a job well done! We’re often intrinsically motivated by rewards (and usually enjoy them more because we feel like we really earned them) so use that to your advantage! Use small treats to keep you moving, whether it’s a nice long bath, watching a movie, going out to lunch, or enjoying a glass of wine in your newly organized living room. 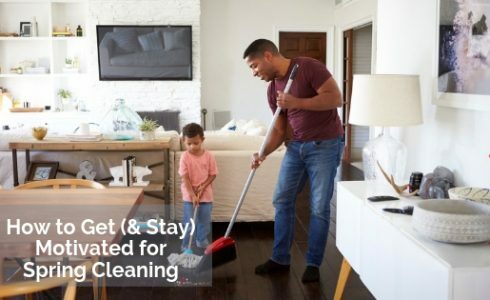 There are a lot of benefits to cleaning your home. You’ll feel much happier and will enjoy your home more in a clean home. These tips will help you make spring cleaning manageable and a bit more enjoyable. Are you spring cleaning in preparation of selling your home? We have several new home communities in Northern California and Nevada. Visit us online at DiscoveryHomes.com and discover the best in life.